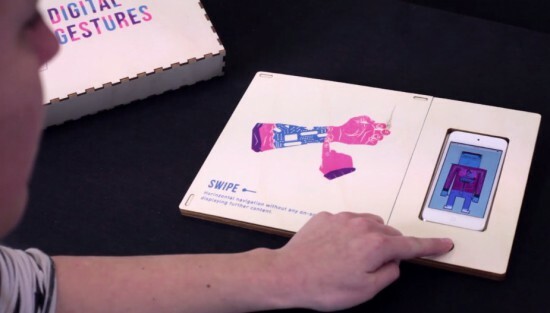 Digital and craft maker lab Tazas recently worked with a group of master students on an interactive book/prototype to reflect on how gestures like swiping have become as natural as shaking hands. Digital Gestures is a metaphor of the human body’s physiological senses, which identifies 10 actions inherent to our daily interactions with technology: drag and drop, spread and squeeze, swipe, double tap, scroll, zoom, rotate, draw, press, press and hold. 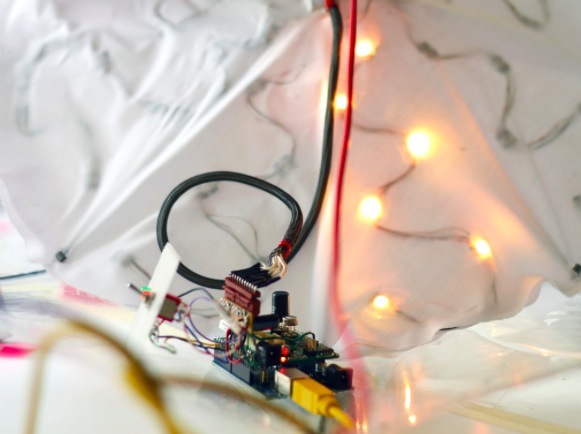 The project was brought to life using four basic electronic components and some digital fabrication: a web server (VPS), an AtHeart Blend Micro Bluetooth module linking objects to the elements contained on the server, an iPod Touch connected viewing medium and conductive ink. All the elements are arranged on a laser cut wooden base, while an iPod digitally decrypts the printed* pages filed on its left. You can see how it magically works below! 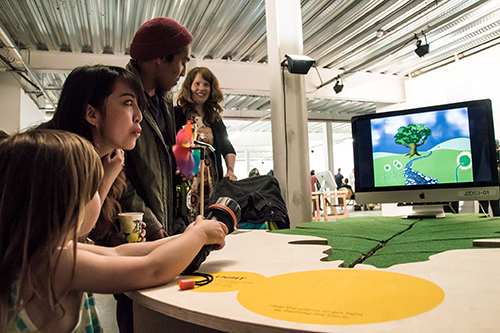 Photosynthesis is an interactive installation for primary school children created, designed and developed by Moritz von Burkersroda and exhibited at P3 Ambika, University of Westminster. It’s a learning experience to understand the abstract process of photosynthesis in a hands-on way. 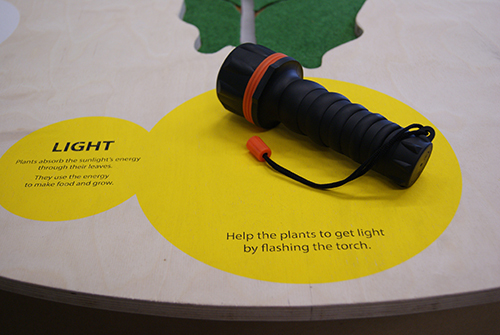 Thanks to a physical interaction kids can easily understand what plants convert light into chemical energy to fuel their activities. 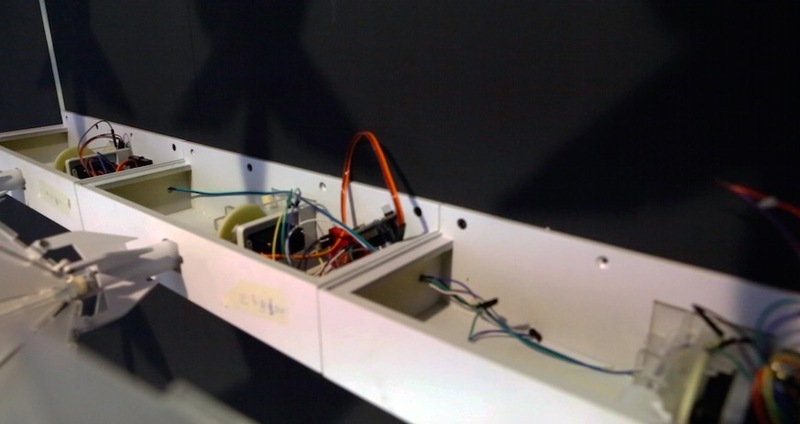 The installation uses an Arduino to measure data from a photoresistor and a hacked Wii-remote to connect the objects with the video feedback on the screen triggered by a Processing sketch. On the page of the project you can download a Design Research Document about Contextual study theory to understand the relationship between interactivity, learning and educational institutions, like museums. Once in a while, South East Asia countries such as Singapore and Malaysia suffers from the haze, a fire-related large-scale air pollution problem that occurs regularly. Especially during dry season there are some persisting forest fires in Indonesia that spread to other countries nearby. In 2015 the haze hit Singapore quite badly, causing schools to close down for one day. 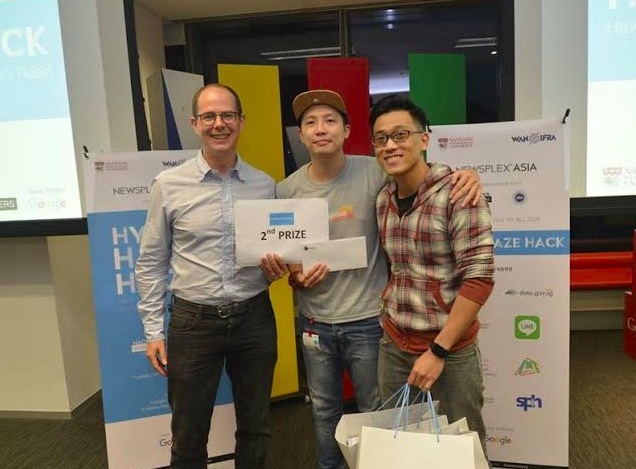 That’s why during Hyper Haze Hackathon taking place in Singapore, Tian Lye Teo and Ethan Lee Yong Sheng worked on and presented a low-cost solution based on Arduino Uno to tackle difficulty to communicate haze rising to illiterate elderly in the nation and won second prize ! The main problem we are trying to address is to help the elderly who are living alone in Singapore during the haze period. There are several factors that make this a suitable source of information for them. While the PSI* reading are widespread, they might not be accessible to these elders (no cellphone, TV, radio) or they do not understand the mainstream languages used by our medium (Chinese, English etc). Furthermore, the PSI reading comes with 2 sets of readings (3hr and 24 hrs) and it is confusing to them what need to be done when PSI reached a certain number (“200 already? so what? aiyo… looks clear lei”). The solution we came up with is this inexpensive Arduino device that fetch current PSI reading from a server. 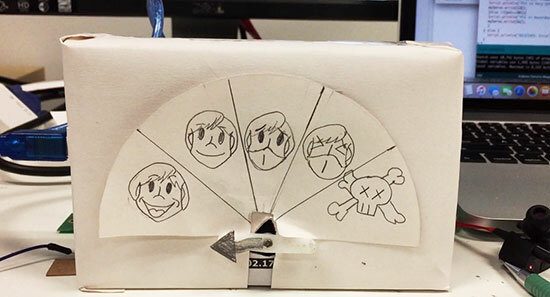 With the reading, the device will point at one of the five indicators that ranges from don’t need to “wear mask” to “die die cannot go out’. 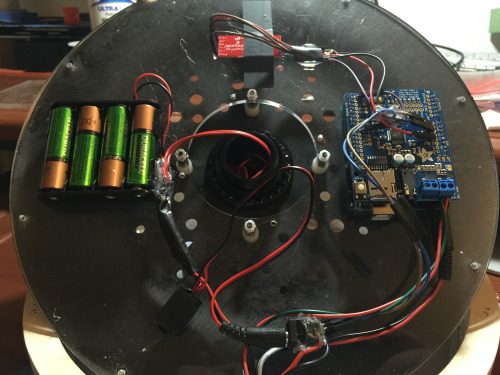 The device actually cost about 20 dollars to build and implementation is ideally done at home. However, we understand that elders would not pay for this (“20 dollars?! I can eat 5 days meals with this”). We are hoping we can get in touch with some organisation(perhaps the govt) to install this at either the lift lobby at every floor or at the ground floor. We believe that even at its current stage, it is still very useful for the elders. *PSI (Pollutant Standards Index) is an index to provide understandable information about daily levels of air quality and it’s the indicator used in Singapore to show how bad the haze is. The monitoring stations measure concentration levels of particulate matter (PM10), fine particulate matter (PM2.5), sulphur dioxide (SO2), nitrogen dioxide (NO2), ozone (O3), and carbon monoxide (CO). All of them determine the level of PSI. 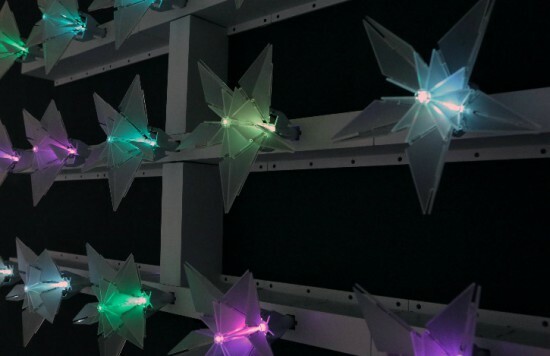 “Under the Dome – PMgami” is an installation created by designer Jiayu Lui using Arduino Nano. 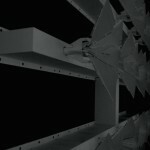 Inspired by paper origami techniques, the digitally fabricated flowers move and change color according to the quality of air measured locally. 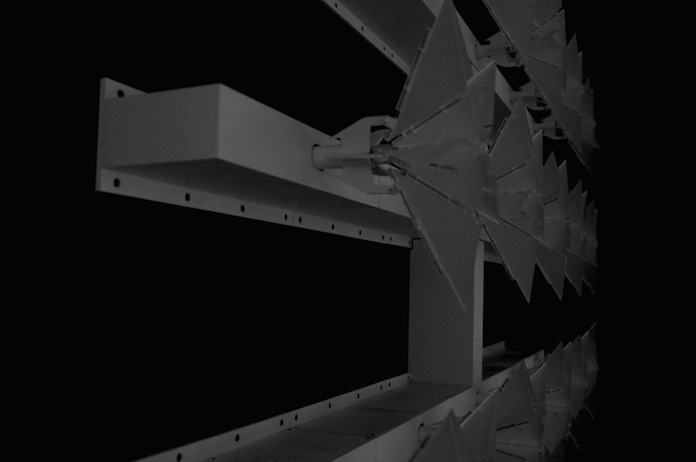 The main aim of the installation is to obtain a more intuitive way to communicate pollution data and the relationship between technology and nature. In the gallery you can explore some other pictures and the schematic. 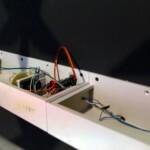 Check the video below to see the installation in action! 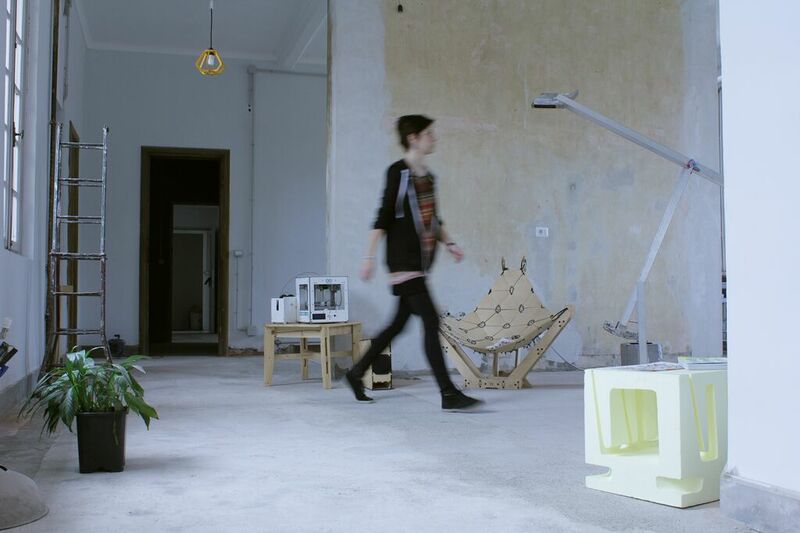 Casa Jasmina, Torino’s Open-Source Connected Apartment, opens its doors on Saturday during Mini Maker Faire in Torino. The unique example of connected apartment with open-source ideals, promoted by Arduino and curated by the futurist and science fiction writer Bruce Sterling, is hosted by Toolbox Coworking in a old industrial building already shared by Officine Arduino (the Italian Arduino headquarter), and Fablab Torino. During the opening, Casa Jasmina will be available publicly for the first time, hosting some local Maker furnitures, an Italian selection of Valcucine kitchen appliances, household works by International Open Source designers (OpenDesk, Jesse Howard, Aker, Open Structure), and a small display of various connected objects and artifacts from the Energy@Home consortium, Torino Share Festival, and designs and prototypes from the first Casa Jasmina “Call for Projects”. In the forthcoming months, Casa Jasmina will host residency programs, workshops and talks. This “house of the future” is not restricted to technicians but is meant for people interested in everyday life under near-future conditions and will be available on AirBnB for futurist weekends in Torino. 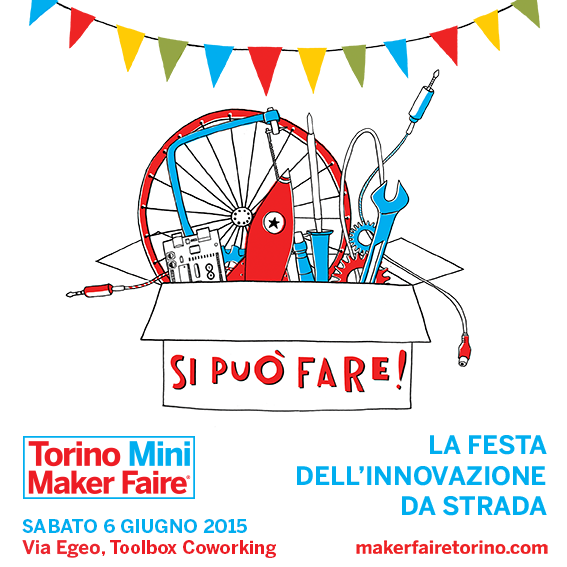 During the day at the Faire from 10am to 7pm, you can explore over 50 makers’ projects, listen to many talks and to the presentation of Casa Jasmina project by Bruce Sterling, enjoy a kids’ area with activities and a lab for the little ones. Casa Jasmina guided tours are starting from 11.30 am. Check the program. 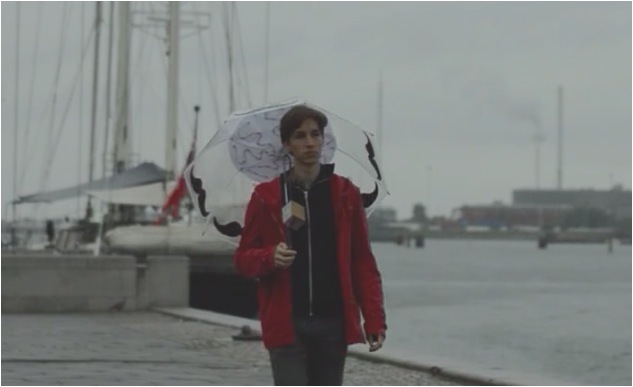 The Sensing Umbrella is the second project I’m featuring on this blog (see the first), coming out of the class at the Copenhagen Institute of Interaction Design called Connected Objects, with Massimo Banzi and Giorgio Olivero. Each umbrella serves as a node for measuring CO and NO2 pollution levels and can provide exceptionally granular data to pollution databases and for scientific analysis. 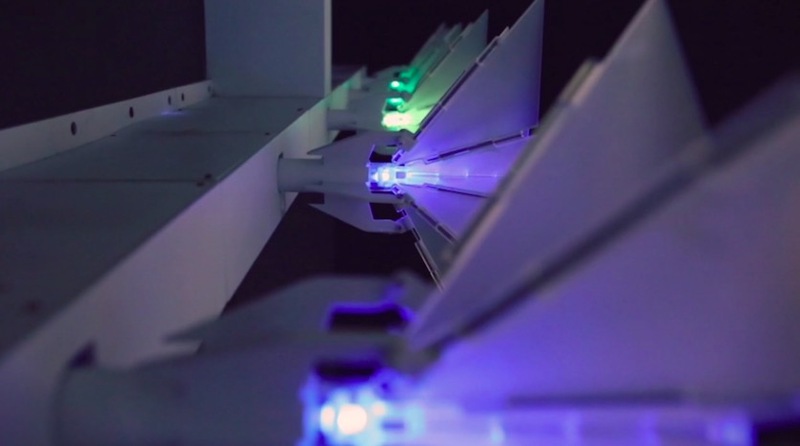 Simultaneously, the light visualisations inside the umbrella respond to pollution levels in real time and spread awareness of air quality in the city for its inhabitants. 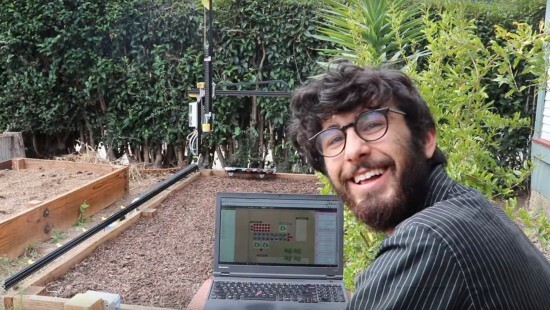 The umbrella uses open hardware and software to gather and interpret data through a built-in sensor array, displays CO and NO2 pollution locally in two modes, and logs the timestamped and geolocated data to the cloud for analysis. 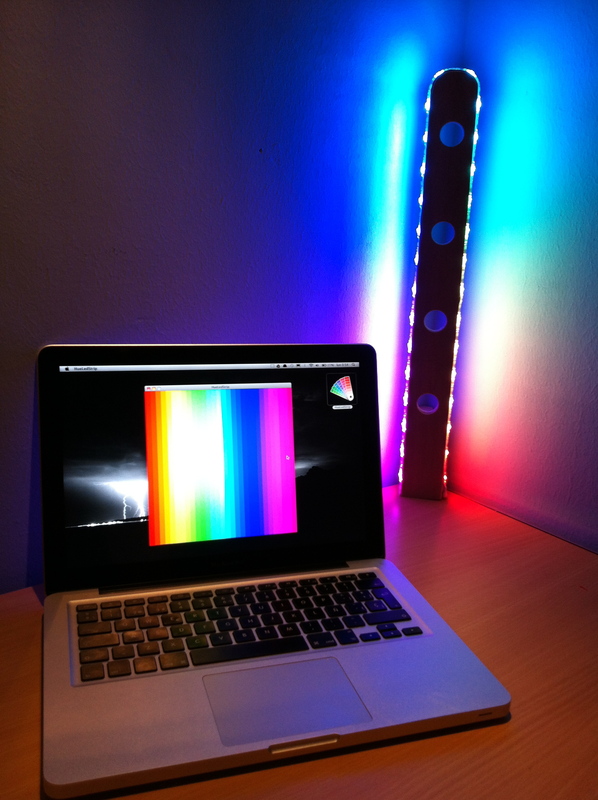 This project shows the operation of an RGB lamp using a digital LED strip. After activating the bluetooth connection, the user can open the GUI on the PC to control the lamp. 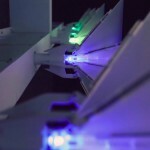 The program shows a hue palette divided into 30 rods, one for each LED of the strip. 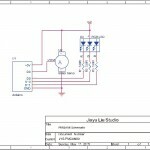 By clicking & dragging the mouse cursor it is possible to make your own patterns,. 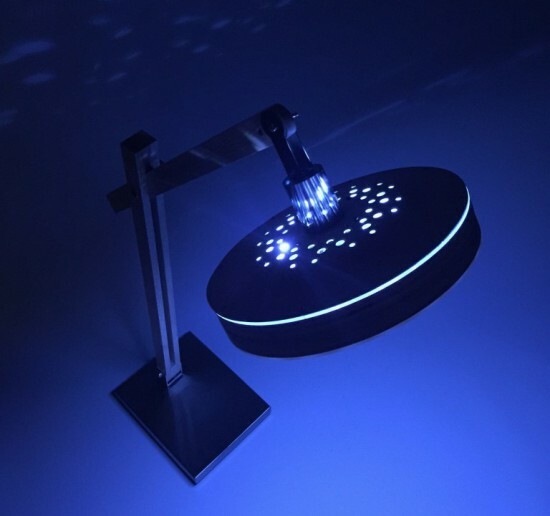 To remove a color, the user can simply click on a rod while pressing the spacebar, which switches off the selected LED. 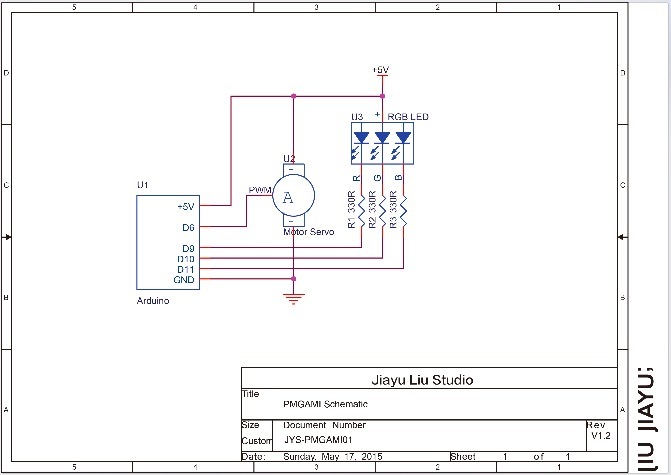 Part list: wooden support, RGB digitally-addressable LED strip, microcontroller (Arduino Pro Mini, for example), Bluetooth or USB wire. 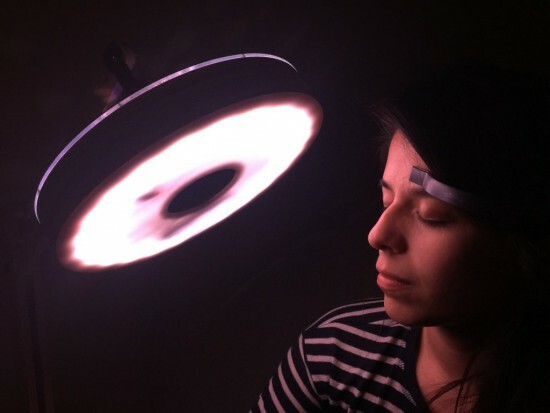 More information on this project can be found on Miguel’s blog, while a brief video about its operation can be found here; the code of the project can be found on Github. The project’s page on Thingiverse can be found here.